While there's no denying that this is a powerful program, it will take many people a long time to fully get to grips with – and the lack of cloud storage is a major drawback. KeePass Password Safe is one of the best known password managers thanks, at least in part, to the fact that there are versions available for just about every operating system, including unofficial mobile ports. It's a password database that can be used to store passwords for websites and applications, as well as notes. The database is encrypted and either protected with either a password or a security file to keep your details from prying eyes. When it comes to entering your stored passwords, you have a couple of options. 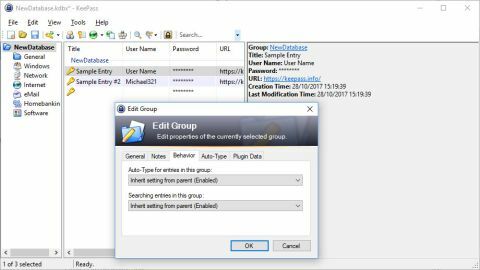 You can simply copy and paste from KeePass Password Safe (there's no browser integration, sadly) or use hotkeys to trigger them. Sadly, there's no form-filling feature, and you will also have to spend time manually compiling your database as there's no way to pull in data from your browser or other programs. There's a massive range of extensions available for KeePass Password Safe. The program is incredibly powerful in its raw form, but there are dozens of ways to add even more capabilities, or tweak it to work better with other software. As strong and feature-packed as KeePass is, there's no escaping its unintuitive design. The interface is far from attractive, and the manual password entry is time-consuming. It's clearly designed with the more technically inclined in mind, and that's a shame for less experienced users. With a bit of work and a new look, KeePass Password Safe could have serious mass-appeal. As it stands though, it's a powerful program whose benefits will only be felt by those who are willing to learn how to make it work for them.